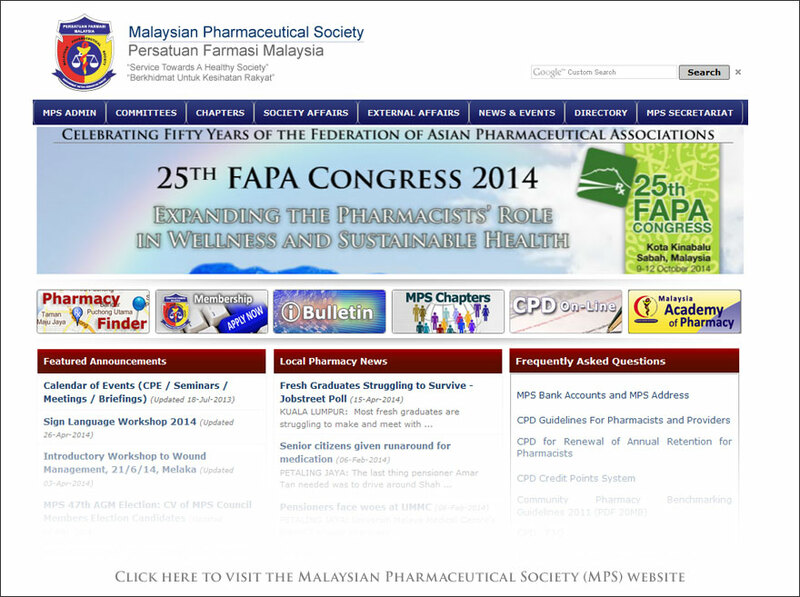 The Malaysian Pharmaceutical Society (MPS) - Persatuan Farmasi Malaysia, is the national association for pharmacists in Malaysia. Its motto is "Service towards a healthy society". The Society also represent the interests of its members and also the general public by having representatives at the Pharmacy Board and the Poisons Board of the Ministry of Health, as well as having interest in the consumers affairs of the Ministry of Trade and Domestic Affairs, and including other Non-Governmental Organizations.The Society aims to promote and maintain the honor and interest of the profession of pharmacy; to encourage and further the development of Pharmacy and Pharmaceutical Education and to foster intra-professional relationship among members; to improve the Science of Pharmacy for the general welfare of the public by fostering the publication of scientific and professional information relating to the practice of pharmacy and aid in the development and stimulation of discovery, invention and research . . . read more at MPS website.